Mark Lemmon designed 3211 Mockingbird in 1924. Mark Lemmon's wife, Maybelle Reynolds Lemmon explained that "During World War I, he was in charge of 250 men in a transport division. During the night, he would bring supplies to the men on the front battle lines in France. His nightly travels took him by the Country French homes in Northern France, this later kindled his desire to build a Country French style home once he was back in the states after the War." Mark Lemmon fulfilled this dream by building his own home at 3211 Mockingbird. He designed this home not only in a Normandy Country style, but also in a Normandy like setting. At the time, the home was overlooking the greenbelt that continued on to Dallas City Hall. Reminiscent of town commons, a forest was down the lane where now sits Highland Park United Methodist Church and Central Expressway was a railroad right of way. The other side of this right-of-way had not yet been developed. 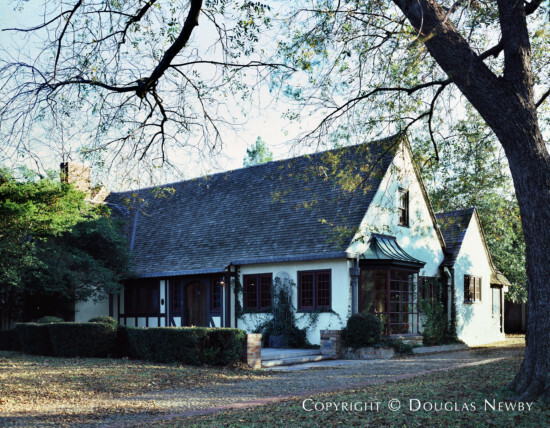 It is my belief that the McNeny Brothers, who initiated Greenland Hills, were simultaneously influenced by the charm and popularity of Lemmon's Normandy cottage for their large cottage development on the M Streets. Lemmon designed the attic to be shelled in, which he did eight years later. This also coincides with M Streets where attics are still being converted to additional bedrooms. Inside 3211 Mockingbird, you will find hand-hewn beams in the living room and massive two to three inch thick doors leading to the formal rooms and library, in keeping with what he saw in the French countryside. The original roof was constructed with an elaborate scheme to resemble the thatched roofs of France. This was done by successfully reducing the amount of wood shingles exposed on each row and repeating the pattern every five rows. The eyebrow effect was randomly built in the roof by gradually increasing then decreasing the number of shingles on various rows. The original roof lasted 45 years. The embossed lead gutters and down spouts were added later when they were purchased at Harrod's in the 1950s on one of Lemmon's trips to London.